Impact International has invested over half a million dollars in a solar energy solution for its Smithfield manufacturing site, which was officially launched today. PKN spoke to MD Aleks Lajovic. 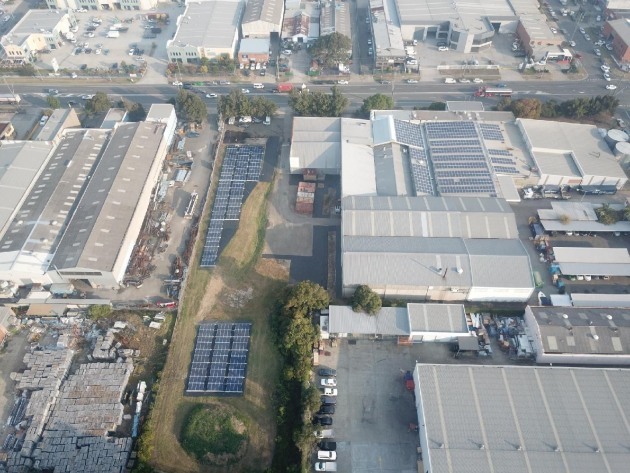 Australian family-owned packaging company, Impact International, has opened the first solar farm in Sydney designed for industrial use. The installation at its tube manufacturing plant in Smithfield was officially launched today by Hon Chris Bowen MP, the current Shadow Treasurer of Australia, and the Hon Dr. Hugh McDermott MP. The solar farm occupies more than 800 square metres and is designed so customers and other visitors can tour the installation to see the system at work. Smart Commercial Solar installed and will monitor the efficiency of the 5B Maverick solar array, a world-first technology developed and manufactured in Alexandria, Sydney. On the eve of the launch, Impact managing director MD Aleks Lajovic told PKN that this move should see at least 30% of the Smithfield plant's total energy use covered by solar energy. "We operate our plant 24 hours a day, so while the sun shines, the 290kw installation will supply 100% of the power for the manufacturing site," he said. It's estimated this will eliminate 300 tonnes of CO2 emissions annually and generating 395 MWh’s of electricity per year, enough to supply all the power needs of 90 Australian homes. Lajovik said this industry-leading installation is just one of a series of steps taken at the plant to reduce energy usage. Over the last 18 months the company has upgraded the motors on machinery to more energy efficient models and re-designed its factory layout to improve production efficiency. "In the last two months, we've installed LED lighting and on top of this we have also changed our production schedules to further reduce energy consumption," Lajovic said. "Our decision to boldly invest in green energy comes from our commitment to our customers for whom sustainability deeply matters," he said. Impact International's supplies local and export markets with around 250 million squeeze tubes per annum produced at the Smithfield site (approximately 80m) and through subsidiary operations in Indonesia and Slovenia. Key industries serviced by Impact are food, cosmetics, personal care and pharmaceuticals, and Lajovic says the biggest growth sectors for the company are natural toothpastes, animal care, pesonal care and sunscreens. "Our customers choose Impact because of our quality, product knowledge, service and the superior barrier properties of our tubes. In other words, they care greatly about the quality of the tubes they use. By extension, the energy that is used to produce these tubes really matters. We want to add to our customers’ story of quality and care -- our groundbreaking solar farm does exactly that," Lajovic said. According to Huon Hoogesteger, founder of Smart Commercial Solar, for manufacturers to be able to say that their energy was generated on-site from the sun is fast becoming a sought after business benefit. "Impact has shown that solar is not only commercially viable for industrial operations but also has critical benefits for the entire supply chain," Hoogesteger. The 5B Maverick system is also readily compatible with energy storage, so businesses can save the extra energy they produce. "Our technology makes it easier and more affordable than ever for industrial users to include solar in their energy mix," 5B CEO Chris McGrath said. "Coupled with increasingly affordable energy storage, it will help remove some pressure from a business' bottom line."